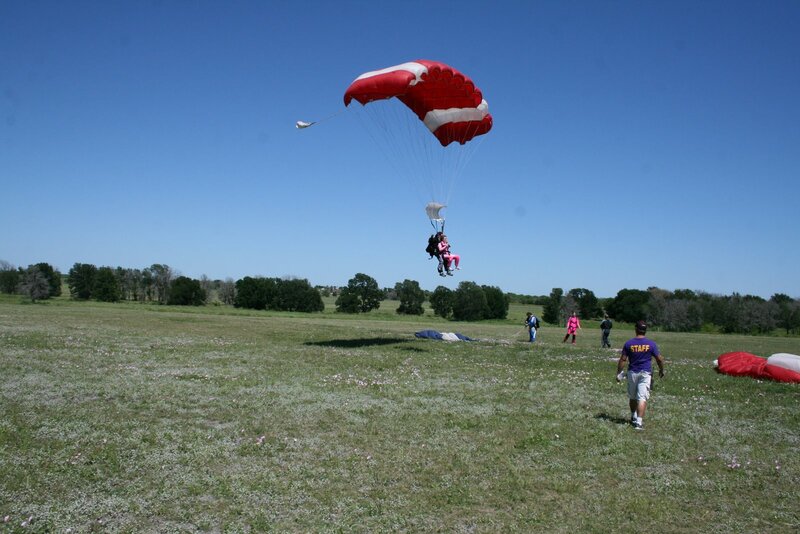 In honor of our 30th birthdays – and perhaps as an attempt not to live beyond them – my friend Keri and I decided to jump from a plane two miles above San Marcos on Sunday. I’m fairly afraid of heights so the idea of plunging from a plane and trusting my parachute to deploy was a literal leap of faith. We arrived at the skydive facility’s Hill Country headquarters and signed forms acknowledging the perilous and potentially terminal nature of our jump. After meeting our guides (a.k.a. 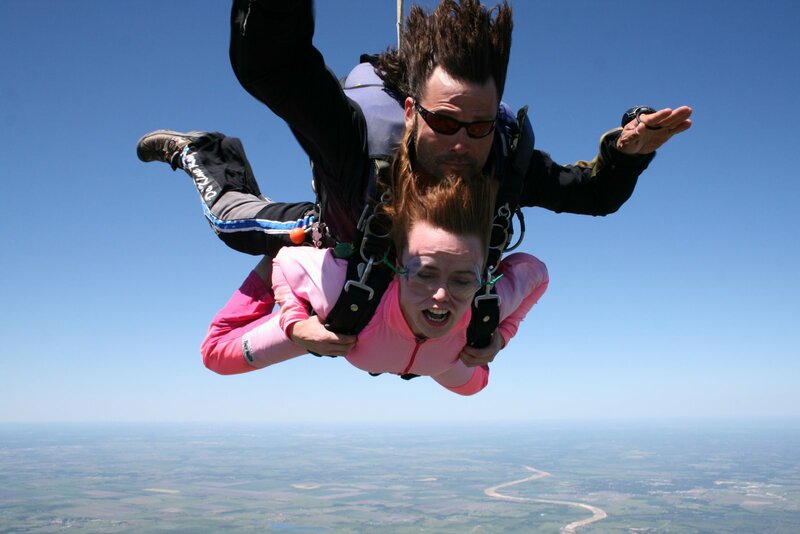 the person strapped to my back, tasked with keeping me alive as I hurdle toward earth at 120 MPH), donning pink jumpsuits and strapping on life-sustaining gear, Keri and I climbed aboard a small plane with a group of other novice jumpers, most of whom appeared as wide-eyed as we were. I tried to reassure myself with the fact that my guide jumps out of planes almost every day in the same way I sit in front of a computer all day – it’s no big deal to him. 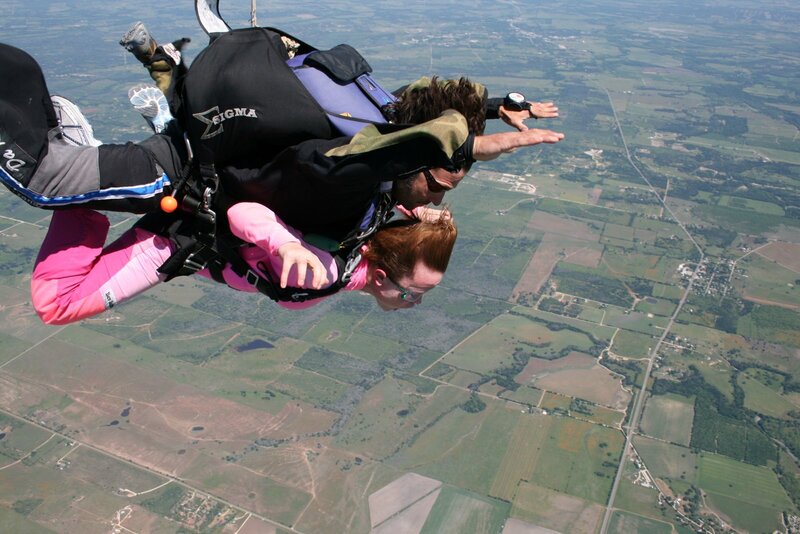 Yet as the plane ascended to 10,500 feet above ground, I realized the jump was a big deal to me. Or at least remaining alive was. The view from two miles above San Marcos, Texas. When the hill country farmland looked like small squares far below us, Keri and her cheerful-looking guide moved toward the open door, paused for a moment and then disappeared into the sky. The last look I saw on her face was a pained expression of disbelief combined with sheer terror. My zen-like guide and I were up next. We paused by the door, the wind whipping our faces, counted to three and pushed out of the plane. Instead of the stomach-in-throat falling feeling I expected and had experienced when bungee jumping, I was overcome with more of a drowning sensation – probably because it was hard to “catch” the air as it sped by so quickly … and because I left my mouth wide open as we plummeted, resulting in a lovely Blowfish look in my free fall photos. I’m obviously having a blast here. 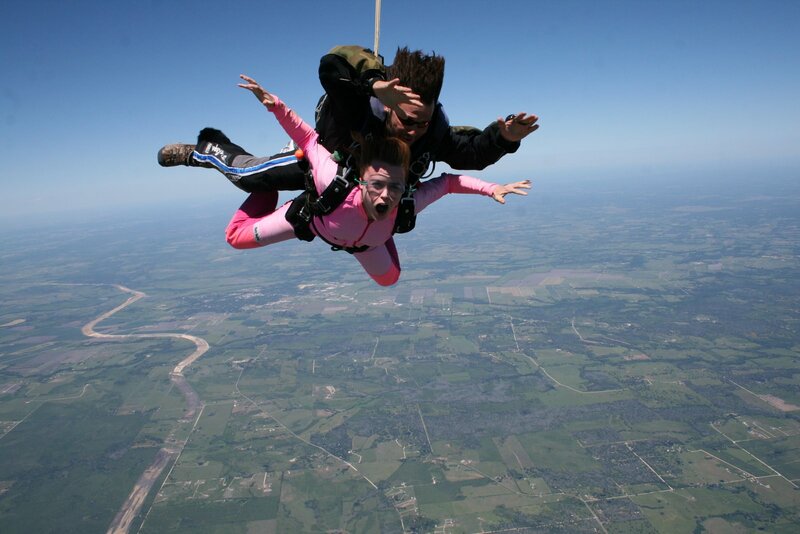 When jumping out of a plane, it’s best to close your mouth or this blowfish look will happen in your freefall photos. Nobody wants that. After 60 seconds, the parachute deployed at which point my guide asked if I was okay – apparently my stricken silence during the free fall concerned him. I gratefully acknowledged that the most dangerous part of our journey to the ground was over, and suddenly noticed the stunning vistas surrounding us. Upon landing, I considered literally kissing the ground, thankful to have defied gravity … and for 30 years of life. The parachute ride wasn’t particularly peaceful, but offered awesome views.